Everybody knows that summer is the peak season for weddings and it has long been that way. Whilst we had a glorious summer, with more sunny days than I can remember in a very long time, we are very rarely that lucky. Savvy brides are cottoning on to the fact that, aside from the weather, a winter wedding can actually provide them with a lot more options and freedom of choice when planning their wedding. With the summer months still proving the most popular for couples to tie the knot in many will find that, if they haven’t booked far enough in advance, their preferred suppliers are booked up. Great suppliers can book up many months in advance, and it can be very disappointing to fall in love with the work of a chosen supplier only to find out that you missed the boat. This is where winter weddings come in to save the day. You are far less likely to find your number one supplier completely booked up very far in advance if it is a winter date. This gives you that extra bit of time to relax and make choices that don’t feel so pressurised. So if you haven’t already chosen the date, consider a winter wedding and embrace all things wintry for the day. 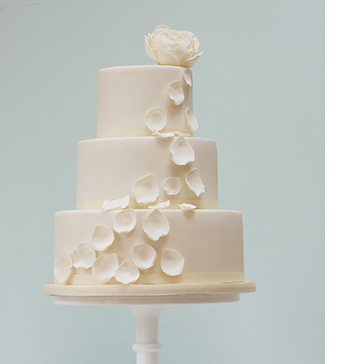 With wedding cakes there are tons of options that will perfectly suit any winter theme. Not all cakes have to be flowery with bright or pastel colours and not all winter themes have to be white and silver. Some great colour combinations for winter are mint blue and ivory, monochrome, dark metallic golds and silvers, ivory and pale yellow with a subtle hints of silvery grey and sage green, and ice blue and pale gold- just to name a few! Piping styles can also perfectly create a wintery feel without coming across as too ‘obvious’. For example piped ivory dots, detailed and delicate lace patterns, and pearlised piping. Pearlised effects, in other details on the cake, can really transform the whole cake giving it a subtle ‘icy’ effect. You needn’t to rule out flowers either. White and ivory Roses, Snowdrops and Anemones can look especially elegant and you can ask your cake supplier to match any type of flower you want to your winter colour scheme. Lastly, don’t forget the flavours. Winter is an excuse to be decadent and choose rich flavours that might not go down so well at a summer wedding; dark chocolate and ginger, carrot and walnut cake, red velvet, fruit cake, and apple and cinnamon, are all perfect for a cold winter’s evening.